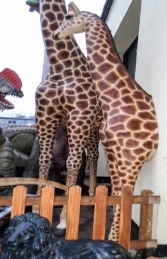 This is a wonderful model of a 12ft Giraffe, it is ideal to use in a jungle or safari themed area or even as something different for your garden. This 12ft tall replica Giraffe is a fantastic statement piece that looks unbelievably life-like. It is designed to be placed against a wall to make it look like it is coming through. 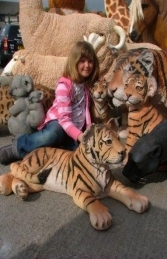 This resin and fibre-glass model would make a striking centre piece or feature in any theme-park and is ideally for generating interest in a business. 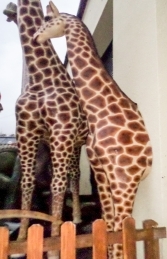 This resin replica Giraffe can be used in any Jungle or Safari themed areas in adventure golf courses, zoos, theme parks or to promote shops, businesses, pubs, restaurants, coffee shops.